Jurison’s Inn – Waikele, HI » Use Exciting in a sentence. Hawaii is a pretty diverse place, especially when it comes to food. We also celebrate many of the trends taking place on the continental U.S., such as having a Starbucks or Coffee Bean and Tea Leaf every 10 miles. But we have our share of Local places as well. One of them is a place in Waikele, called Jurison’s Inn, which I highly recommend. They serve all kinds of old school/homey-cooked-feeling items like patty melts, and mushroom chicken.. and a lot of local menu items such as Ahi Katsu roll, mochiko chicken, fried saimin, teri chicken bowls, etc. They’re reasonably priced, and everything I’ve tried (and my friends or family have tried) has been good. Here’s a link to their Yelp page and a really good review on ‘Ono Kine Grindz. Despite my current diet, I couldn’t resist the patty melt. The combo came with a choice of fries, macaroni or tossed salad (I chose tossed salad). It’s a hamburger patty melted with cheese, onions, and mushrooms on rye, with thousand island dressing. Wow. 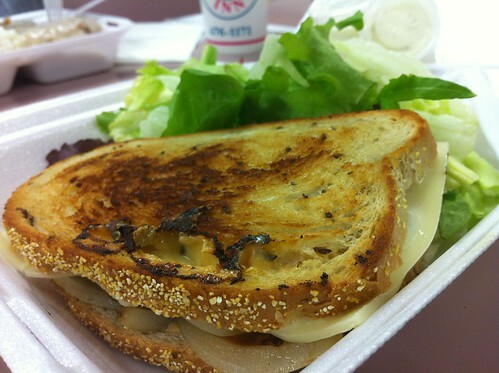 This entry was posted in food, hawaii, reviews and tagged jurison's inn, patty melt, review, waikele. Bookmark the permalink.